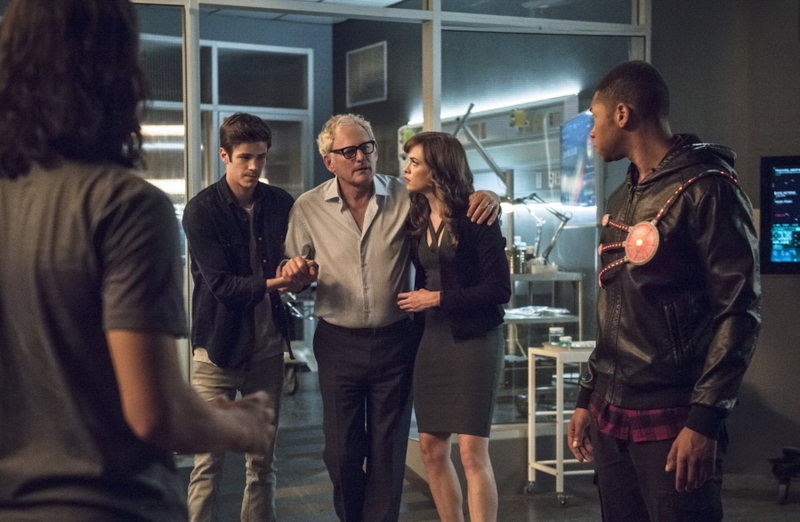 The Flash Review (S2E4): "The Fury Of The Firestorm"
Yes, Tuesday's episode of 'The Flash' was used as the origin story of Jax Jackson (Franz Drameh) as Ronnie Raymond's replacement and the stabilizing force that saves Martin Stein's life. Yes, that storyline was predictable right down to the rejected candidate Henry Hewitt (Demore Barnes) becoming a baddie, Tokamak, a play from the character in the comics. Yet, the elements that relate to this season's main storyline made it all worth it especially if you know the comic book mythology and saw that ending. In the previews leading up to the episode, Jackson is seen firing up as Firestorm so we knew he'd be the perfect fit but we didn't know how he became such an eligible candidate. Once a smart and promising football quarterback, Jackson is consumed with energy from the exploding particle accelerator leaving him too broken to continue his athletic dreams. Recovered and working as a mechanic he's not interested in being a superhero when approached by Team Flash. This stuns Caitlin the most because who wouldn't want to be a nuclear man capable of shooting fireballs and flying? Although, more surprising was Caitlin's elitism when another candidate, the highly-educated Professor Hewitt and more intellectual than Jackson, is found to be a decent match but not as compatible as the former baller. Not to worry, though, Caitlin learns a valuable lesson in seeing beyond her preconceptions and trying something new. Lessons like that seemed to be the theme as Joe tried to convince Barry of the same in regards to exploring a possible romance with Patty Spivot (Shantel VanSanten) who seems smitten with the handsome forensic scientist and secret superhero. You know, that way he could stop obsessing over Joe's daughter like he has for years. Seems like a reasonable piece of advice. Elsewhere, Iris is dealing with some mama drama. It turns out her estranged mother has cancer and is looking to reconnect with the daughter she left behind before it's too late. Naturally, Iris is suspicious and her investigation determines that her mom does have cancer but she uncovers something she wasn't so forthcoming with. Eight months after she left Joe she had a child. Is it Joe's? Where is this grown child now? Could it be Wally West that we're expecting this season? Of course it is and now we know how he comes to Central City. The writers took an interesting route to bring Wally on the show, but I'm not sure this was the best way. Revealing Iris' mom as a drug addict who abandoned her and had a child that Joe knew nothing about just as a gateway to introduce Wally is a hell of a way to go. As expected, a showdown takes place against Hewitt. Stein and Jax develop a little chemistry while taking him on along with Barry. Firestorm is whole again just in time to head over to 'Legends of Tomorrow' midseason. Spivot has added some nice energy and shaking things up a little, putting Barry out of his comfort zone as the flirtee as opposed to the flirter. The foreshadowing in the episode of a reported man-shark in Central City pays off big in the final moments of the episode. Barry gets snatched up by the throat, as he does from time to time, by a giant buffed out shark-man, presumably King Shark from the comics. "Zoom wants you dead," the beautifully rendered and scary CG monster tells him before getting zapped in the back by a guy in a hoodie. Hoodies in the CWDC universe are everywhere! Harrison Wells of Earth-2 finally makes himself known just before the credits roll. He's only previously seen burglarizing Mercury Labs earlier in the episode, but this reveal is shocking but extremely short. It short-changes the audience because the episode was more about establishing characters for another show. Anyway, King Shark's appearance was pretty darn cool and hope it's not his last. Check out the preview for next week's episode "The Darkness and the Light"